They developed an elaborate setup called "near-field desorption postionization time-of-flight mass spectrometer" (NDPI–TOFMS) and used it to detect and map chemical molecules in HELA cells—a human cell line and workhorse in cell biology. The dried cells were put on a stage and an ultraprecise laser scanned the surface by etching craters a few tenths of a micrometer in size. The desorbed molecules were ionized by another laser beam and then identified in the mass spectrometer. As the authors pointed out, the advantage of this method is that the cells can be imaged at the same time as sample acquisition, thus enabling "co-registered chemical and topographical imaging within an individual cell." Indeed, their 3-D reconstructed images revealed the signals for proflavine, a drug that was added to the cells, exactly where they were expected: in the cytoplasm and around the organelles. The three-dimensional information was gathered to account for the uneven surface. In contrast to the available mass spectrometry imaging techniques, this "hybrid technique," which combined scanning probe microscopy and mass spectrometry "provides undistorted high-resolution chemical mapping of irregular surfaces," says Hang. 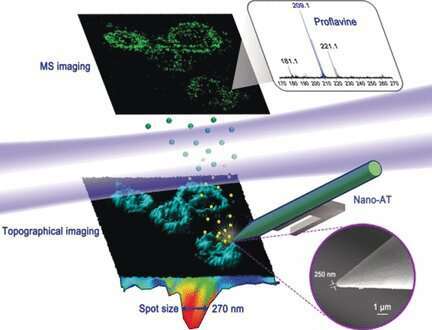 Given the compact nature of the device, the authors recommend its implementation in diverse mass spectrometry imaging setups, but especially where biological samples are concerned.